Courtesy of Cibolo Creek Realty, LLC, Travis Wagner. Country living at it’s finest! 60 Acre high fenced ranch overlooking private lake, Rock Cliff Reservoir. Level & usable land perfect for cattle, horses, or runway. Large warehouse for equipment, storage, extra housing. Horse stalls & chicken coop on property. Approximately 800 sqft guest home not included in sqft. 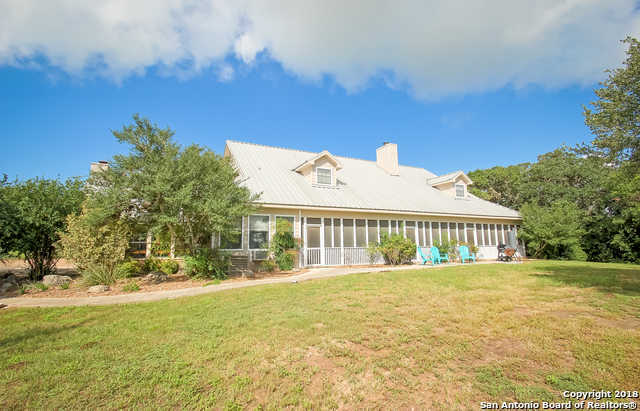 Main house has 4 bdrms, large living room, open kitchen, & wrap around screened porch. Great fishing on private pier & boat ramp. Perfectly situated for great breezes & dodging the afternoon sun.